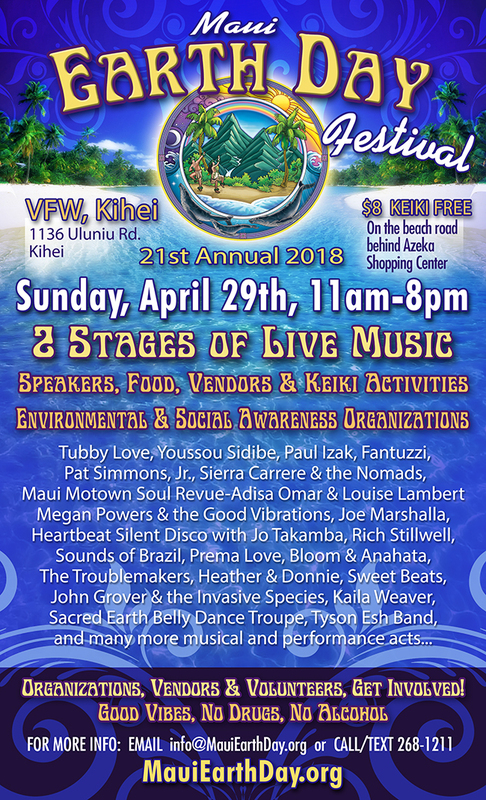 3) If you would like to be a FOOD VENDOR at the event please know that we will give preference to food vendors who use organic, non-gmo ingredients and we require the use of only biodegradable cutlery, dishes, cups and containers (no plastic or Styrofoam). 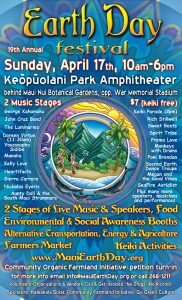 For any food vendor reservations please email vendors@MauiEarthDay.org or call or text Dee (805) 403-5458. 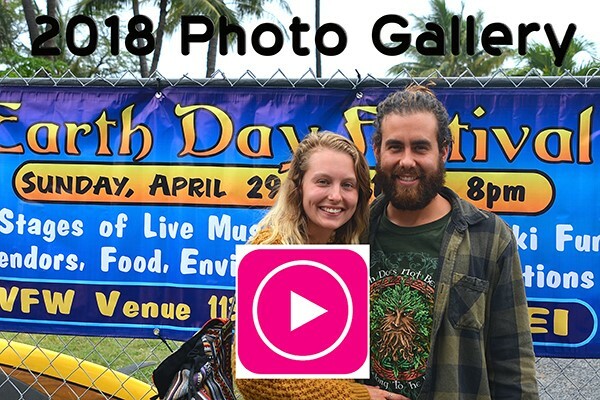 4) If you want to be an ECO VENDOR or CRAFTER at the event, then tell us about your product and service and email us at vendors@MauiEarthDay.org or call or text Dee at (805) 403-5458. VENDOR FEE: $25 Vendor fee + 20% of sales at the event (makes Earth Day possible by going towards covering the costs). 5) Blessed are the VOLUNTEERS. 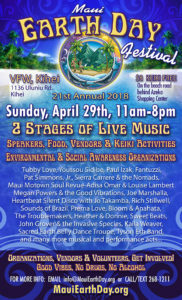 Earth Day Festival is coming right up. As usual it is produced and supported by volunteers. We hope that many will come forward to help since it makes it easier and more fun for everyone that way. Even if you have only an hour or two to contribute, we can find a slot on the day of. Or maybe you want to help with set up on Saturday or break down on Monday morning and just party on the day of. 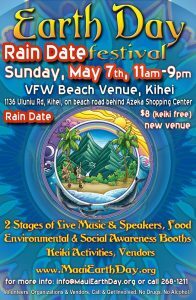 To volunteer please email info@MauiEarthDay.org or call or text Satya at 268-2898. Please try to make it to our one and only volunteer meeting on Tuesday, April 17th, at 7:30pm at Mandala Creations, 29 Baldwin Ave in Paia. We are sure that together we will have an amazing day of joy and inspiration!